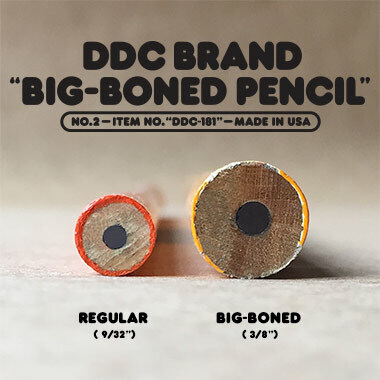 Draplin Design Co.: DDC-181 "Big-Boned Pencil"
Take a pencil and beef it up. From the normal 9/32” to a big-boned 3/8”! What else needs to be said? How about this: These things will take a beating. Get a couple of these BIG-BONED pencils and get BIG-BONED results! 02. Works in pencil sharpeners.The biggest hole! 03. Big, beefy and big-boned! Or, “BBP”…Big, Beautiful Pencil. 04. Over 100 miles of markmaking in each unit. 05. Gummy material on end known as an “eraser.” Corrects mistakes. 06. Brute-force pad-printed ink application. 07. Good for doodling, sketching, shading and general pencil needs. 08. For both left-handed and right-handed patrons. 10. Proudly Made in the U.S.A.